HER LIFE IN AFRICA. MEMOIR AND APPRECIATION. BY THE REV. GEORGE T. BASDEN,M. A., F.R.G.S. On the morning of Friday October 7th., 1910 it fell to my lot, as Acting Secretary, to welcome Mr. and Mrs. J. B. Stewart to the C. M. S. Niger Missions and I count it as one of the privileges of my life to have been the one to receive them into the fellowship of the Gospel in the IBO Country. They had reached Onitsha on the stern-wheeler "Ndoni" late the previous evening. After disembarking they proceeded to the head-quarters of the Mission and, for a few days I had the pleasure of their company as my guests. Mr. Stewart had for several years laboured in the Brass District of the C.M.S., prior to returning to Jamaica for furlough. Later the work at Brass was transferred to the Niger Delta Pastorate and Mr. Stewart, therefore, came to the lbo Section of the Mission on his return from furlough. With him came Lucy, his wife, (nee Drysdale) then a bride of but a few weeks. One scarcely thinks that the conditions and prospects could have appeared brighter for a young couple. They were both in sound health and keen to enter upon their new sphere of service. They were full of hope, Mrs. Stewart particularly bright. She, indeed, retained a wonderfully cheerful spirit at all times and very seldom did the clouds of despondency fall upon her. A more uniformly happy disposition it would be very difficult to discover. From Onitsha they moved on to Awka which was to be their appointed home in Africa. For a little over two years everything went well. A daughter was born to them in September 22, 1911 and their cup of joy was full. In December of that year I returned from furlough to resume the charge of the Training College. Mr. and Mrs. Llewellyn, also members of the College Staff, were just leaving for Jamaica, and Mr. Stewart became my right hand man in the work of the College and District. From the time of my return from furlough I lived in the closest association with Mr. and Mrs. Stewart, and this constitutes the reason why I feel irnpelled to write this appreciation of the latter. She was always bright, always eager, ready at any moment to do her utmost to forward the work in these parts, and there was no time of pressure in which her assistance was not forthcoming. She often helped in the Bookshop; she had sewing classes for the girls, and a class for the women attending the Church in the Town. She was, I venture to think the most appreciated woman in Awka during her residence here and she was beloved by all. The natives looked up to her and they loved her, especially the younger folk; they loved her, spontaneously, feeling that she was ever ready to assist and befriend them. And so the days passed, full of work but very happy days until, suddenly, disease made its blighting appearance. This rnanifested itself by a slight swelling of the feet towards the end of February. As the doctor had been consulted by her but a short time previously, and she seemed to be in her normal state of health, no great significance was attached to this symptom for a week or two, especially as we knew the doctor would be visiting Awka at an early date. Altogether there was nothing which gave rise to any special anxiety on her account. The doctor came, as a matter of fact, on March 14th and immediately detected the insidious features of Bright’s Disease. Without a moment’s delay she was placed under proper treatment. To make this more sure, and to secure sound nursing, she was removed to the Mission Hospital at Iyi-Enu, where she spent the remainder of her days under the unremitting care of Dr. and Mrs. Druitt. But none did or could have anticipated that the Disease would make such abnormally rapid strides. At first the measures taken seemed to succeed, and it was felt that after a short period of special nursing she would be quite fit to undertake the journey to Jamaica and arrangements were being made with this object in view. After ten days or so, however, it was apparent that the disease was making headway; there was not sufficient improvement to justify her attempting to travel alone and special leave was granted to Mr Stewart to enable him to take her home. The next day we laid her to rest in the Cemetery at Onitsha where a large number of friends gathered to pay their last respects to the dead and to express their sympathy with those who had suffered loss. It was a perfect evening. As the service at the graveside came to a conclusion the last rays of the setting sun were disappearing below the horizon whilst from directly overhead the pale silver beams of the young moon shone down upon a scene of singular beauty. A more glorious evening could not be imagined. Our loss is great - too great for us to measure at this stage. Only as the days pass do we realise how much we miss her. Jamaica gave to Africa one of her best in Lucy Stewart and all here knew it. Let it not be thought for one moment that such a life has been thrown away or in any way wasted. Far from it indeed. Her works do follow her and the memory of her will be fragrant for many years to come. I feel that I have lost a real friend and words fail me in reckoning up the personal loss of such a one. She is at rest; her work is done, her crown is won, and with “Christ she is far better.” We cannot grudge her her new found joy in the presence of her Master. Could anything have been more beautifully expressed, and with grander simplicity, than “I am going home?” What a wealth of meaning; what a glorious truth those simple words contain. We recently announced the death in West Africa of Mrs. J. B Stewart, a missionary daughter of Jamaica. In our issue of June 21st., page 5 appeared an article on her work from the pen of the Rev. George T. Basden, M.A., Principal of the Training College at Awka, British W. Africa. 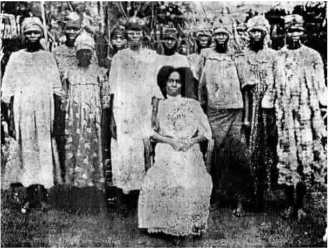 We to-day produce a picture of Mrs. Stewart surrounded by a group of African girls among whom she worked and with whom her influence was a potent factor. Mrs. Stewart was well known in Kingston as Miss Drysdale. She went to Africa with her husband immediately after their marriage and threw herself heart and soul into the Mission Work. Their first Station together was at Onitsha, then they were moved to Awka. Our readers will remember that Mr. Basden, in the article above referred to speaks in very high terms of appreciation of Mrs. Stewart’s character and work. She laid down her life at the post of duty. I do not know much more about the Stewarts. Lucy's husband, Jacob, who had first gone to Nigeria in 1905, returned to Jamaica on furlough in 1916, perhaps bringing their 5-year-old daughter, Eva, with him. He returned to his work in Nigeria in 1917, but by the early 1920s he had to return to Jamaica, his health shattered. He died in 1923, at the age of 45. Eva seems to have been brought up by her Drysdale aunts, her mother's sisters. She attended the Anglican girls' high school, St Hugh's, and then and later received a good education in music. During the 1930s she became known as an organist, pianist, and as an excellent accompanist. At that time she played chiefly for church functions, but in the later 1940s, besides having a music studio, she organised a trio, and on into the 1960s she played at clubs and for visiting singers. I have not been able to find anything more about Lucy's daughter after the mid-1960s; I hope someone can help!